Our stay in Santa Barbara was a whirlwind of activity. We arrived Sunday afternoon and spent the remainder of the day chatting with new friends and recovering from the sleepless night passage. First thing Monday morning, we got busy provisioning, refueling, doing laundry, making trips to the internet café, tidying up the boat, blogging, etc. Some of these items seem insignificant, but we are on foot and even minor tasks require a great deal of transportation time. Using her pedometer, Trisha reported that the laundry facilities were 1000 steps away from our slip. We enjoyed crossing things off the to-do list as we prepared for time at anchor. 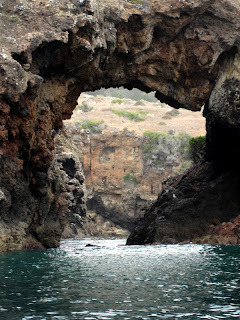 At 0930 Wednesday morning, we set out motor sailing the twenty-two miles to Santa Cruz Island. It was foggy, the winds were light, and the ocean was like glass. Following the advice of a fellow at the marina, we set a course for the western end of the island. Once to West Point, we turned east and enjoyed the scenery cruising ten miles or so along the coast. The scenery was magnificent. Mountains slope to foothills that abruptly end in cliffs that fall into the sea. 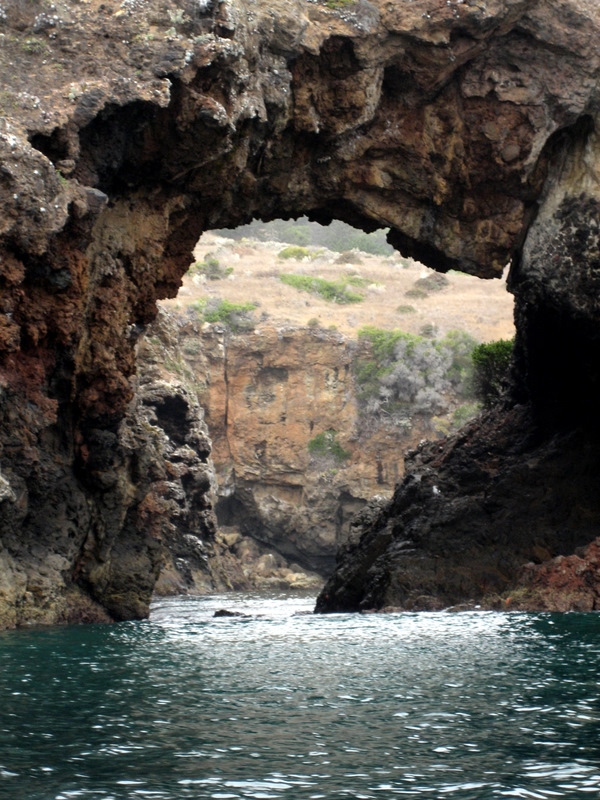 The cliffs are jagged with many coves and caves. 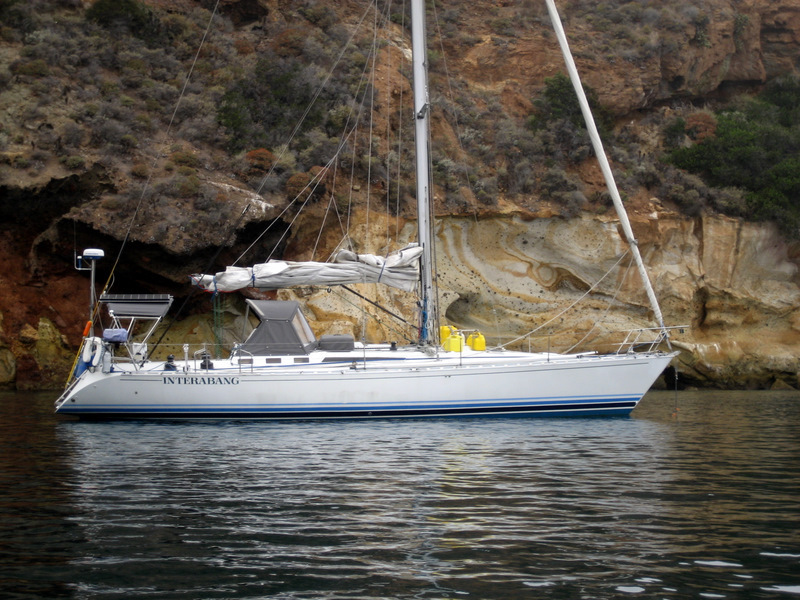 By 1600 we were anchored next to a spectacular cliff in Pelican Bay. 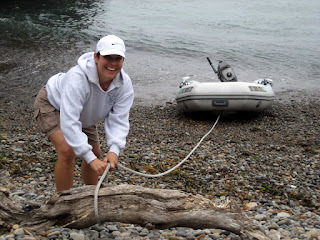 The next morning we launched the dinghy for a closer look at the jagged shoreline. We went ashore and explored the ruins of a hotel that last did business in the 1920s. 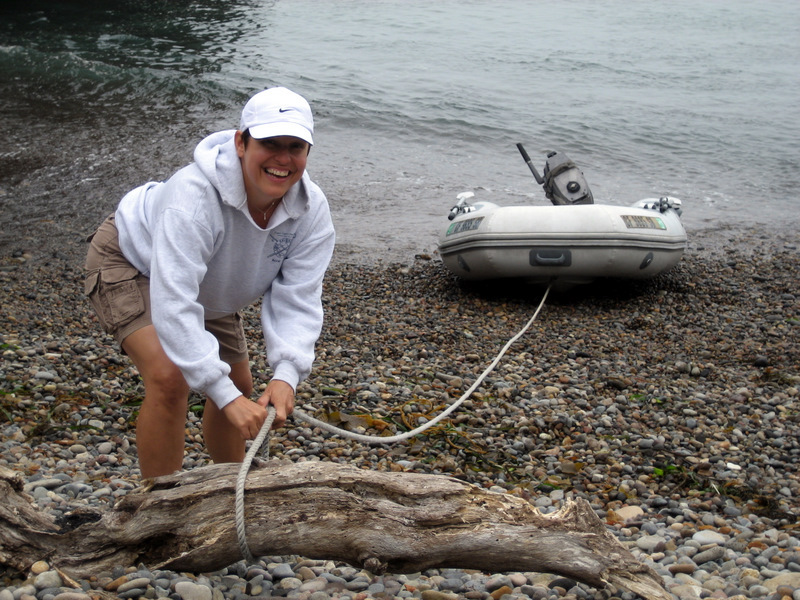 The plan was to move to another anchorage on the third night, but the weather report gave warning of a low pressure system approaching from the south that featured thunderstorms and gusty wind. We decided that it was probably best to stay put. 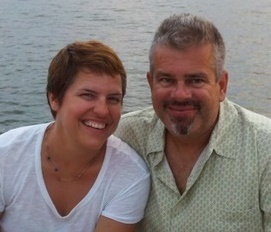 That turned out to be a great decision because we met Ken and Monica from San Diego sailing on Endeavor. We enjoyed a drink together and swapped boat stories. It is always great to meet new friends. Saturday, we underway by 0800 and on our way back to the mainland. We saw pod after pod of dolphins. They were amazing. 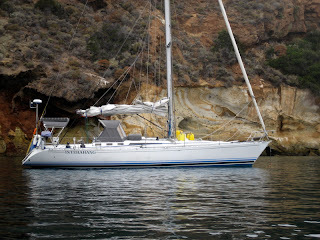 After fifty or so miles of motor sailing, we rounded Point Dume and anchored in Paradise Cove, better known as Malibu.